The death of a college student in a Georgia jail has been ruled a homicide. The 22-year-old died from several blunt-force injuries to the head and upper body, according to the county coroner. The student was found dead in restraints on New Year's Day. Matthew Ajibade's cause of death “is listed as blunt force trauma, which was really a combination of several things that were enumerated in his autopsy report by the GBI," Chatham County coroner Dr. Bill Wessinger said. He said he based his conclusion on the results of an autopsy by the Georgia Bureau of Investigation (GBI), which declined to make its report public. Wessinger cited "abrasions, lacerations, skin injuries about the head and some other areas of the body. There was some small amount of blood inside the skull case." However, the coroner stressed “that homicide does not necessarily mean murder. It can be, but it's death at the hands of another person,” the Savannah Morning News reported. Ajibade's family learned of the cause of death from the death certificate – but not until a photo of it showed up on social media, according to their attorney, Mark O'Mara. "It's really disgusting to me," O'Mara told AP. "They owe anybody the common decency of letting them know first how their son died." The family was completely unaware that a death certificate had been filed, he added. 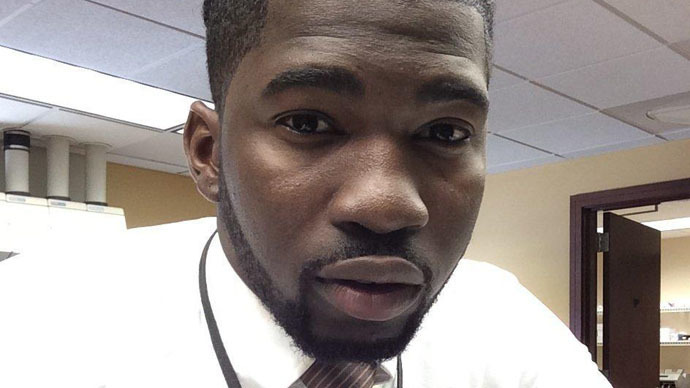 Last month, nine deputies were fired in connection with Ajibade's death. According to Chatham County Sheriff Al St. Lawrence, the terminations were based on the results of an internal investigation, as well as one by the GBI. Sheriff's department spokesperson Gena Bilbo said the deputies were let go for multiple reasons, including policy violations, not being forthcoming in the investigation, and standing by and not doing what they should have done. Although the sheriff did not release any findings from the investigations, a February 9 memo was issued reminding deputies that they were prohibited from using stun guns on detainees already in restraints. The 22-year-old Nigerian student, who suffered from bipolar disorder, was arrested following a call about a domestic disturbance. When officers arrived, they found Ajibade holding his girlfriend under a blanket, according to an incident report. According to O'Mara, Ajibade was having a manic episode at the time. He said the girlfriend gave officers Ajibade's medication, and was told that he would be taken to the hospital. Instead, he was taken to jail. “It seems he got no medical attention. The only thing he got was restraint," O'Mara said. Once at the jail, sheriff's officials say the student was placed in a restraining chair in an isolation cell after becoming physically aggressive during booking and injuring three deputies. The department said that one deputy suffered a concussion and broken nose. Deputies said they conducted checks on Ajibade, and that he was found unresponsive during the second check. CPR was administered by the jail's medical staff, and a defibrillator was used – both unsuccessfully. The Chatham County jail said in May that on-site personnel will now be notified immediately if someone who needs medication is booked into the system.